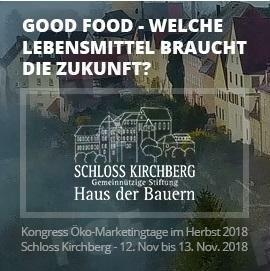 The event dedicated to Eco-Marketing will take place in November, 12 at Shloss Kirchberg Academy. The main subjects of the event are the Bio-production, economy and product quality. The conference will also include several workshops and excursions. Among other participants, there are Professors professors from several German universities and representants from large agricultural and food companies Jürgen Mäder, CEO EDEKA Southwest and Dr. Ursula Hudson, President of Slow Food Deutschland. It will be great honor to participate in such important event, as it is a great opportunity for networking and developing new contacts, as well as drawing attention to our project. FOODCOIN team is always glad to share the ideas.